Hello, I hope you are enjoying your stay at my site. This page here is for Holiday Decorations. If are wanting more then one crocheted item e-mail me because the price will be cheaper on postage. Ohio Residents pleae add 7% sale's tax to yout total. These are some Christmas decorations that I have designed. These would look cute in your home. Price for these is $5.00 each. If you would like to make these yourself the price for the set of patterns will be $4.00 and doesn't includes postage. This will include a color photo with each pattern. These are very easy to make. If you have any questions just send me an e-mail. Here is some milk cap ornaments that I finally got made. Price Starts at $2.50 each and doesn't include postage. This hot pad is so cute. The colors came out dark in photo so the hat is Claret and the scarf is hunter green. Price for one of these is $7.00. Postage not included. Are you a snowman collector. Here is a very cute snowman to add to your collection. 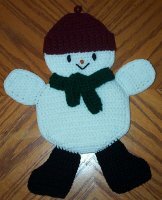 Price for the snowman is $8.00. Postage not included. This Christmas boot can come in any color that you want it to be. Would make a great gift at Christmas time for someone. Can fill it with anything. Price is $7.00. Postage not included. This Candy cane is one of my own designs. Price is $3.00. Postage not included. 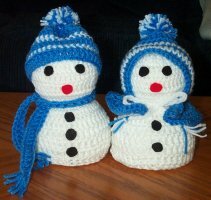 I think this snowman set is really cute. Great decor for your holiday season. Price for this set is $16.00. Postage not included. This stocking measure's about 14" long. Price is $12.00. Postage not included. This stocking measure's about 16" long. Price for this one is $14.00. Postage not included. Stocking #3. Price is $25.00. Postage not included. This stocking measure's 18" long. Price for is $18.00. Postage not included. 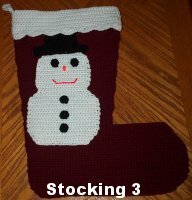 Price for this stocking is $25.00. Postage not included. This stocking measure's about 12. Price is $10.00. Postage not included. Gingerman Stocking. Price is $12.00. Postage not included.